California Hali-what? Are you fluking kidding?! California Halibut has been lying to you. It's actually a flounder - more closely related to a Fluke than a Pacific Halibut! Don't run away just yet, California Halibut is a staple fish in most sushi restaurants where it is highly regarded for its clean and fresh flavors and its buttery texture when served raw. Our local fluke is one of the mostly highly regarded fish as San Francisco is the most northern part of the fishery, so our fish are exposed to cooler waters than the fish in Southern California. In order to combat mislabeling and confusion in the seafood supply chain we will label our "California Halibut" as it's actual name - Flounder. We will still refer to it by its common name since most people do not immediately associate Flounder with Halibut, but it's true and proper name will be reflected in all of our labeling. Is Halibut available all year? Unfortunately not! Our local Halibut season runs from April until around November. Unlike other seafood options - Halibut is at its best throughout the entire season! What's the difference between Pacific and California Halibut? California halibut have less than 77 dorsal soft rays, and the eyes may be on the left or right side of the head; Pacific halibut have more than 80 dorsal soft rays, and the eyes are always on the right side of the head. The corner of the mouth of California halibut extends beyond the eye. Pacific halibut are typically caught in deep water, off northern California. Pacific Halibut often clock in at above 100 lbs, while California Halibut rarely come in above 30 lbs. Buy a whole fish? Learn to fillet it like a pro! This awesome video gives you the step by step on how to prepare your whole halibut for a meal. Whole Halibut are also great baked or grilled whole, so consider that before you start filleting! Gordon is back! Tandoori Halibut! This classic Gordon Ramsey recipe is a FreshCatch favorite - just promise us you won't play with your fillet like Gordon does for the first 45 seconds! California Flounder are bottom dwelling fish that occasionally venture up when they are hungry. They eat small fish and cephalopods like anchovies and squid which they tear apart with their sharp (horrifying) teeth. They spend most of their time on the sandy ocean floor closer to the shore that you would think. Outside of the water California Flounder is one of the most amazingly easy fish to prepare, and its one of the best fish for people that "don't like fish." It easily absorbs most any flavor, and it becomes flakey and buttery as it cooks, but be careful not to overcook it or it will end up almost steak-like. 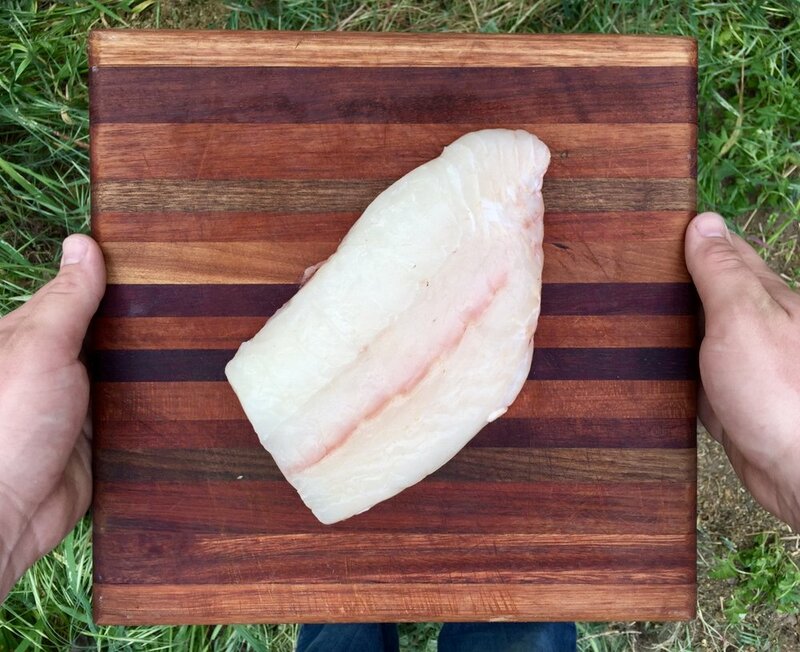 While most of us think of halibut and think of heaping 3-4 inch thick fillets; however, our local halibut is thinner and wider, offering an easier cook that is more forgiving and cooks quickly. Think of it as the juiciest, thickest, most decent sole fish that you will ever eat and you will not be disappointed! Whether you prefer fresh tuna or a filet of halibut, they all have at least 30 percent of your recommended daily intake of protein in one serving! Tuna and halibut are both low-fat sources of protein with just 73 to 100 calories per serving. They're also rich sources of vitamins B-6 and B-12, potassium and healthy omega-3 fatty acids. Like most FreshCatch offerings, Halibut is a relatively short lived fish, some reaching maturity as soon as 1 year old, and the rest are there by age 3. Reports have seen some California halibut come in around 30 years old; however, something like that is pretty rare. California flounder caught in California with trolling lines is a "Best Choice." The stock is considered healthy, there are no bycatch concerns, management is moderately effective overall and trolling lines have minimal seafloor impacts.